For those of my readers that don’t know, my husband and I recently moved from San Diego to the Rheinland-Pfalz region of Germany. We are so excited to be back in this area – a place we also lived from 2010-2012 – and look forward to eating and traveling our way across Europe once again. The only downside of the move is that our household goods – including nearly all of my kitchen gadgets and supplies – are on a boat moving verrrrrry slowly in this direction. Until they arrive in mid-November, most of my posts will feature recipes once included on an old blog of mine. Oldies, but also hopefully goodies! 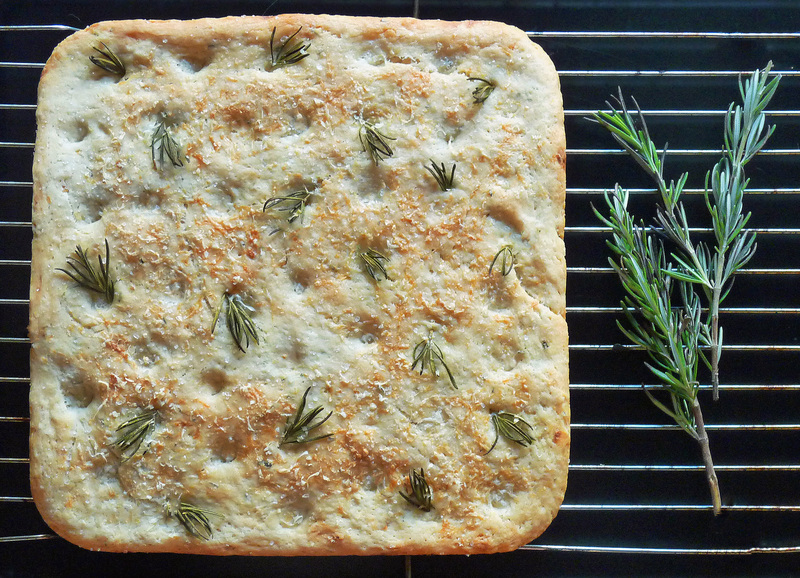 The last recipe I made before leaving California was this loaf of Rosemary Garlic Focaccia. While cleaning out our fridge for the move, I was determined not to throw away a large bundle of rosemary that a friend had generously offered as a gift from her garden. There are few savory flavor combinations I enjoy quite as much as garlic and rosemary (or garlic and any fresh herb, for that matter! ), so this bread was an easy pick. With six cloves of garlic, it packs quite the punch; while that’s right up my alley, you can use less if garlic isn’t really your thing (or you need to speak within six feet of someone in the next 48 hours). 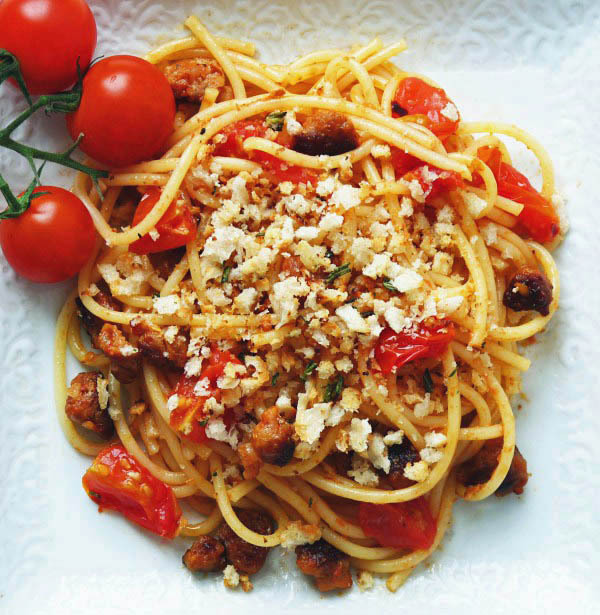 As homemade breads go, this is relatively easy – and it soaks up pasta sauce like a dream! In a small bowl, dissolve yeast in ½ cup warm water. Let stand 10 minutes, then add 2 tablespoons olive oil. Combine flour and ½ teaspoon salt in a large bowl. Strip and chop leaves from 5 of the rosemary branches and stir into flour with chopped garlic. Add yeast mixture and 1 ¼ cups water and stir until dough becomes too stiff to continue. Turn out dough onto a floured surface and knead until smooth. Shape dough into a ball, transfer to a large oiled bowl, and cover with a damp cloth. Allow dough to rise in a warm spot for 2 hours. Transfer dough to a lightly oiled baking sheet. Knead dough down and press with oiled hands into baking sheet. Cover with a damn cloth and set aside for one hour. Whisk together remaining 3 tablespoons olive oil and 1 tablespoon water in a small bowl. Remove cloth from dough and dimple dough with your fingertips, then brush with oil and water emulsion. Arrange small sprigs of rosemary from remaining 3 branches over dough and sprinkle with coarse sea salt and grated Parmesan cheese. Bake until golden, 30 to 40 minutes. Allow to cool for 10 minutes before slicing and serving.